For 15 years, I wrote for the magazine, Berkshire HomeStyle, based in Columbia County, NY serving the tri-state area. As their garden editor, I included monthly columns: Dig In and To Do in the Garden. In my earlier career, I wrote art reviews for the Berkshire Eagle. More recently, my focus has been on community issues, the environment, and farming for The Berkshire Edge; Berkshire Food + Travel. In Mexico where I live part -time, I've written for Aténcion, a weekly paper in San Miguel de Allende, about local water issues, street art, and El Charco del Ingenio, a botanical garden. As a freelance writer, I contributed to national magazines such as Horticulture and The Huffington Post on the flourishing of street art in San Miguel de Allende, Mexico. Horticulture Magazine; The Berkshire Eagle; The Women’s Times; The Berkshire Edge; The Huffington Post, Aténcion. For years, my photographs illustrated my writing; today, to a certain extent, it is the reverse. Still for my blog, called Journal, I seek to offer some background information, vignettes and stories related to my photographs. 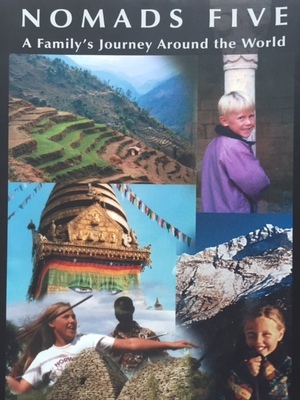 Traveling a year abroad with my husband, David Lippman and our children, inspired me to publish the book, NOMADS FIVE, A Family Adventure around the World, a collage of writings, photographs as well as illustrations from our daughters, Alexandra and Nadia. (Sadly, it is out of print). Below is a link on a chapter on native plants in the gardens at The Mount, Edith Wharton's Gilded Age estate in the Berkshires, MA. Read her full chapter HERE. On the topic of gardens and publications, my garden, Seekonk Farm in the Berkshires received a Golden Trowel Award from the magazine Garden Design. In addition, it was featured in the book, Great Gardens of the Berkshires by Virginia Small, with photographs by Rich Pomerantz.